A powerful, funny, richly observed tour de force by one of America's most acclaimed young writers: a story of love and marriage, secrets and betrayals. A powerful, funny, richly observed tour de force by one of America's most acclaimed young writers: a story of love and marriage, secrets and betrayals, that takes us from the backyards of America to the back alleys and villages of Bangladesh. In The Newlyweds, we follow the story of Amina Mazid, who at age twenty-four moves from Bangladesh to Rochester, New York, for love. A hundred years ago, Amina would have been called a mail-order bride. But this is an arranged marriage for the twenty-first century: Amina is wooed by - and woos - George Stillman online. For Amina, George offers a chance for a new life and a different kind of happiness than she might find back home. For George, Amina is a woman who doesn't play games. But each of them is hiding something: someone from the past they thought they could leave behind. It is only when they put an ocean between them - and Amina returns to Bangladesh - that she and George find out if their secrets will tear them apart, or if they can build a future together. The Newlyweds is a surprising, suspenseful story about the exhilarations - and real-life complications - of getting, and staying, married. It stretches across continents, generations, and plains of emotion. What has always set Nell Freudenberger apart is the sly, gimlet eye she turns on collisions of all kinds - sexual, cultural, familial. With The Newlyweds, she has found her perfect subject for that vision, and characters to match. She reveals Amina's heart and mind, capturing both her new American reality and the home she cannot forget, with seamless authenticity, empathy, and grace. At once revelatory and affecting, The Newlyweds is a stunning achievement. She hadn't heard the mailman, but Amina decided to go out and check. Just in case. If anyone saw her, they would know that there was someone in the house now during the day while George was at work. They would watch Amina hurrying coatless to the mailbox, still wearing her bedroom slippers, and would conclude that this was her home. She had come to stay. Amina thinks, "Their courtship had more in common with her grandparents'which had been arranged through a professional matchmaker in their villagethan with her parents', who'd had a love marriage" (p. 28). Are there fundamental differences between finding a partner on the Internet and traditional matchmaking methods? What might make a traditional arranged marriage or one made online appealing to men and women in the twenty-first century? Readers expecting an exotic story set in a foreign locale won't find it in The Newlyweds. But those looking for a beautiful narration of one woman's gradual coming of age (think Nazneen in Monica Ali's Brick Lane) will love Freudenberger's novel. Despite her foreignness and her circumstance, Amina is an everywoman - forging ahead in life, making the best choices she can while figuring out how to live with their consequences: some good, some bad, all hers to own. (Reviewed by Poornima Apte). Freudenberger moves gracefully between South Asian fantasies of American life and the realities of bone-cold, snow-prone upstate New York - and turns the coming together of newlyweds Amina and George into a readers' banquet. Grade: A.
Freudenberger, a deliciously precise and perceptive writer, loosely based Amina on a woman she met on an airplane... we can only be glad they struck up what must have been a helluva conversation. In the end, Freudenberg's anatomy of a modern arranged marriage is somewhat too dependent on cultural clichés to entirely satisfy. Well executed but a bit too obviously studied - more willed than felt. Starred Review. This classic tale of missed chances, crushing errors of judgment, and scarring sacrifices, all compounded by cultural differences, is perfectly pitched, piercingly funny, and exquisitely heartbreaking. Exceptional... Here is an honest depiction of life as most people actually live it: Americans and Asians, Christians and Muslims, liberals and conservatives. Freudenberger writes with a cultural fluency that is remarkable and in a prose that is clean, intelligent, and very witty. Once in a while, you come across a novel with characters so rich and nuanced, and situations so pitch-perfect, that you forget you're reading fiction. The Newlyweds is that sort of novel. I was floored by it - captivated from beginning to end. And now that I'm done, I can't stop thinking about it. Wise, timely, ripe with humor and complexity, The Newlyweds is one of the most believable love stories of our young century. Limpid, precise prose, clear as glass, magnifies, slows, and allows us into the heart of this love story set in a globalized time. Freudenberger has rare humanity, and talent great enough to command not only a vast landscape of imbalance and misunderstanding, but also a tender sphere of tiny intimacy, hidden yearning. The Newlyweds is a marvelous book. In The Newlyweds, when Amina returns home to Bangladesh, her mother picks up a box of freshly-made sondesh from a reputed vendor to bring to Amina's aunt. Bangladesh shares the Bengali language with the Indian state of West Bengal. Bengali sweets (mishti) are famous all over South Asia and sondesh is particularly well-known. Like most other Bengali sweets, sondesh is a milk-based treat made from fresh cheese (paneer). 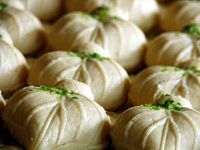 The word sondesh (or sandesh, as it is spelled in the rest of South Asia) is both singular and plural and means "messages." The sweets, it is said, got their name because the dry confections were often sent along with the bearers of good news.